Double Pole Star Tents feature a distinctive design, with their unique shape ensuring they will be noticed at any event while also offering much needed protection from the harsh Australian sun. The Double Pole Star Tent is one of the most popular marquees in our range. This unit offers functionality, stylish appearance and fantastic value! They are the ideal promotional marquee and have large, flat panels that are perfect for custom digital printing. The Double Pole Star Tents and Shades are made in four standard sizes. As we design and manufacture all our own products, we offer a unique flexibility when dealing with our clients. Our Double Pole Star Tents and Shades start at 13.5m x 8.5m and go all the way up to our mammoth 22m x 14m Star Shade. 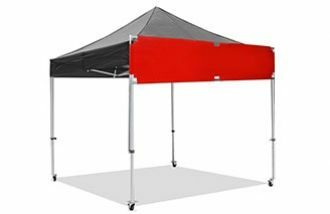 This is the king of all Star Tents and Shades and perfect for large events where you need to provide cover and a cool environment for big crowds. Below, you can find more information on each of our standard sizes in the Double Pole Star Tent Shade range. Be sure to browse through all our products to find the perfect marquee. We also have a range of banners and promotional products to compliment your Double Star Tent or Shade cover. Although the smallest structure in our double pole Star Shade range, this marquee offers a great undercover area and large flat side panels suitable for printing school or club logos. Perfect for rowing regattas, sports days and school fetes. Our mid-sized double pole Star Shade is easy to set and is made from our UV 50+ waterproof commercial grade fabric, perfect for custom branding for your business. Sitting in the middle of the Double Pole Star Shade Range, the 19x12m model covers a huge area and is an outdoor shade perfectly suited for any large outdoor event or festival. The roof can be digitally printed on one or more panels. The 22x14m Double Pole Star Shade is a huge eye-catching structure designed with ease of use and maximum visibility in mind. All roof panels can be custom printed to create branding possibilities as enormous as the area this star shade covers. Our Double Pole Star Tents and Shades come in a variety of eye-catching colours and can transform almost any outdoor space. They are available in both light weight polyester or a heavy-duty PVC. We will be able to offer full printing of your double star shade no matter which material you choose. Our polyester fabric is strong, durable, waterproof and has undergone thorough fire resistance tests. The fabric is light weight which makes for an easy set up and transport. Printing on this fabric is done by a special heat transfer paper sublimation process. This process involves several steps. Firstly, the fabric is passed through two rollers where a temperature of 200 degrees Celsius is reached. This process preshrinks and stabilizes the fabric. The artwork is then printed onto a special digital printing paper, which is then fed through the rollers along with the fabric to transfer the prints. This style of printing produces vibrant fabric colours and is almost impossible to scratch. We also use Sioen PVC for our Double Pole and Star Tents and Shades. Sioen, a Belgian company, is a world leader in advanced manufacturing of fabrics and renowned for supplying only the highest quality PVC, a heavy-duty fabric that will last for many years before perishing. This fabric is cut into sections and then heat welded together. To print on it, we use a two-stage process. The PVC is passed through large format digital printers. Six Seiko ink heads spay ink directly onto the PVC surface. After printing, the PVC is then coated with a clear sealant to both lock in the colour and provide resistance against scratching. Simple and Easy! The Double Pole Star Tent is one of the best engineered marquees for affordability, printing surfaces and ease of set up in Australia. Contact Us Now for more information!